Everyday Democracy envisions a country in which everyday people engage people across their community in dialogue and community change with an equity lens. Over the years, we have seen the power of coaching and training community coalitions, but there are limits to the direct assistance our staff and senior associates can provide. That is why we are now working with “anchor partners,” or intermediaries, who will help carry out our work and principles on a larger scale than we can alone. Download a printable handout with information about our anchor program. We are looking for additional Anchor Partners whose principles are closely aligned with ours, and who wish to build and/or strengthen their own capacity to provide coaching and training on community engagement to local communities in their states, regions and issue areas. As anchor partners become part of a learning network with us, they share lessons across geographic regions and issue areas. They will have the opportunity to contribute to a larger movement of regional and national organizations dedicated to strengthening democratic capacity for community voice and change. We see this as a critical pathway to scale and embed participatory democracy in the United States. Why have our Anchor Partners chosen to work with us? "Community Partners supports families changing the odds they encounter each day. Our investment in sincere relationships with families allows us to better understand their unique neighborhood hopes and challenges. Through our coordination with existing community systems we use the Dialogue to Action framework to create a consistent and equitable platform in order to facilitate these important conversations." 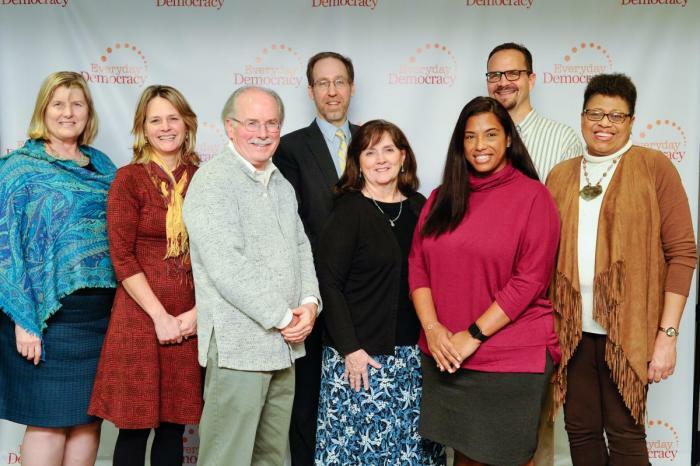 "The West Virginia Center for Civic Life has learned from the broad experience of Everyday Democracy for nearly two decades, and we are delighted to be among their initial group of anchor partners. We have seen firsthand how deeply communities here in West Virginia and around the country have benefited from their keen insights and thoughtful public practices. All this--plus a relationship of mutual respect, shared learning, and joyful communication. Connecting with Everyday Democracy is an inspiring and uplifting venture!" "I am excited to be representing Montana State University Community Development and work with Everyday Democracy on this collaborative effort. Since our time working together many years ago on the Horizons program, I have looked forward to opportunities to work collaboratively, share resources, and partner to accomplish our mutual goals. From our many native communities, to the rural towns across the state, to our fast growing cities, Montana is fortunate to be an anchor partner with our friends at Everyday Democracy. How does Everyday Democracy choose and work with anchors? Together with the potential anchor, we complete assessment tools to identify areas of joint learning and areas in which they may want to receive training and coaching from us. We also identify areas in which the potential anchor has excelled and can offer advice and supports to Everyday Democracy. Our aim is to create a true learning partnership that strengthens the capacity, reach and effectiveness of both organizations. As anchor partners begin or strengthen their capacity to coach and train communities and groups in their state or region on Dialogue to Change principles and practices, in using a racial equity lens, and we support them in their documentation and learning. Through Everyday Democracy, these anchor partners continue to receive capacity-building support, become part of a learning community with other anchors, and become engaged in regional and national efforts to build a movement for equity and a stronger democracy. Anchors are not funded by Everyday Democracy. Instead, we invest our time and resources in strengthening their capacity so that they are better poised to advance equitable community change and also leverage new partnerships and sources of support. We also invest our time in co-learning so that their work in turns strengthens the work of Everyday Democracy and other anchor partners. Everyday Democracy and Anchor Partner New Hampshire Listens (NH Listens) are working embed inclusion and equity practices in Nashua’s immigrant inclusion initiative. Everyday Democracy and Anchor Partner Housing Partnership of West Palm Beach are using Everyday Democracy's Dialogue to Change process on issues such as race, early childhood education, and building strong neighborhoods. Contact Valeriano Ramos, our director of strategic partnerships and alliances, to start a conversation on becoming an Everyday Democracy anchor partner.